Driving on Russian roads is a constant death-defying challenge. When you're not dodging drunk drivers, parrying preoccupied pedestrians or mesmerised by massive meteors you even have to worry about where you park your car, from the looks of this video on OnlyMotors.com. Having successfully negotiated all the hazards on the road, you'd think that this Bentley driver would consider their car safe once parked up off the street. However, the owner of this car wasn't so lucky. CCTV footage published by Russia Today shows a shower of concrete falling on top of the posh machine as careless construction labourers work above. 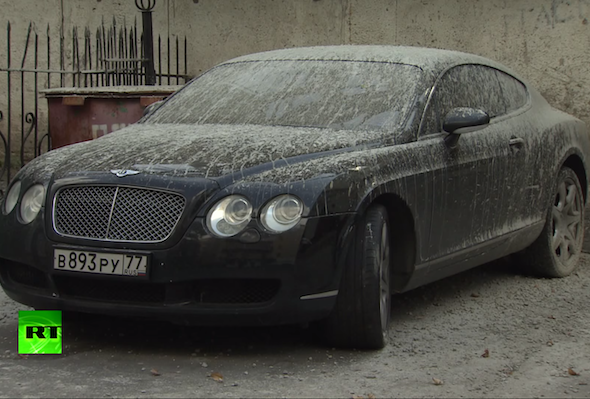 Wet concrete is splattered across nearly all of the Bentley along with the Kia and Mitsubishi parked alongside. Just as sod's law dictates, it's the Bentley that gets the brunt of it.